A memory game offering two game modes: classic cards or Cluedo cards including 8 characters and 8 weapons from the board game. At each start, the back of the cards and the playing mat randomly change appearance. 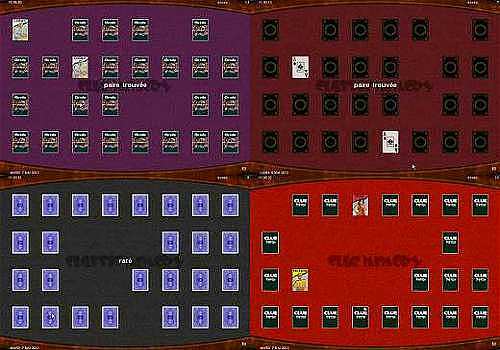 The cards are shuffled at the beginning of the game, the goal is to try to memorize the location of the different cards in order to find the two identical cards forming a pair. The game is over when all the pairs have been found. The number of tests is displayed at the top right of the screen. If you score 16 tries, you're a champion! If you reach 100 tries or more, eat a lot of fish, it seems to be good for your memory. How to play? Do not modify or delete the "classic.sav" and "cluedo.sav" files, they are your backup files. Installation/uninstallation are simplified and automated. They do not modify the system or the registry. 123 FREE Memory Card Games 2003 is a collection of five memory games: Ace-To-King, Concentration, Forget-Me-Not, Memory-Up (6x4) and Memory Up (8x5).